Joining the Boy Scouts of America�is the best way to expand a boy's social, physical, and personal health and skills.� I know and believe this wholeheartedly from seeing it happen day after day for a dozen years now. 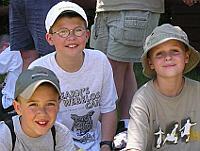 These three little guys joined a Boy Scout troop 6 years ago.� They each got a Scout Handbook and learned a wide range of useful life skills, such as swimming, cooking, and first aid.� They also learned cool outdoors skills, like camping, hiking, navigating, and astronomy. More importantly, they worked together all the time, learning how a team needs leaders and followers to be successful.� Each of them had opportunities to both follow and lead. As they went on campouts, participated in meetings, and earned awards, they passed their knowledge onto the younger scouts that joined after them.� This mentoring is the main way a troop lives - it's a cycle that repeats over the years. 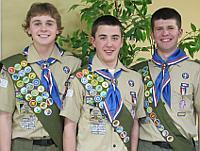 Their time in Boy Scouts provided a well-rounded experience, not only physical development or only mental development as can happen with sports or academics.� Scouting provided them with an extremely wide range of challenges so they could strengthen their existing abilities and expand their breadth of skills. It's not a coincidence that you hear so many famous and successful Americans were Boy Scouts.� Take a peek at this list of Eagle Scouts.��There's no reason a boy you know can't someday be on that list. Last night, I attended another Eagle ceremony.� It was for a scout across town in a different troop.� Every troop does things a bit differently so I wanted to see how this troop ran its ceremonies. It was great to see the audience had boys ranging from 6 years old to 18 years old, as well as many adults in Scouting uniforms.� Much of the ceremony was directed at the younger scouts, encouraging them to have fun in Scouting and someday become an Eagle as well.� This encouragement from older scouts to younger is a common theme and one of my favorite parts of Scouting. The part of the ceremony I enjoyed the most was watching the color guard retire the flags.� It was made up of a Cub Scout from each rank - Tiger, Wolf, Bear, Webelos - and you could see how nervous and proud they were as they bravely walked to the front, retrieved the flags, and carried them out.� These were elementary school boys in front of an audience of 150 or so people. Every boy should be a Scout and the easiest way to get started is to visit the Be A Scout website to find a pack or troop in your town. You have until October 19 to enter.